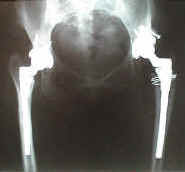 Cheryl F's bilateral hip x-rays. Notice the metal wire band around the left femur. Put there to help heal a fracture in the femur caused while hammering in the new prosthesis during surgery. Not uncommon.